Designed for proofing, production and photography markets, the Canon ImagePROGRAF iPF6300S printer is a versatile solution for large format printing. Featuring an 8-colour LUCIA EX ink set and a generous 160GB hard drive with a 348MB RAM, it has built-in calibration and allows borderless printing, making it ideal for advertising, retail signage, portrait, and contract proof projects. The Canon ImagePROGRAF iPF6300S uses the Canon FINE inkjet technology, with a built in Status LCD and a wired connectivity interface using USB and Ethernet ports. 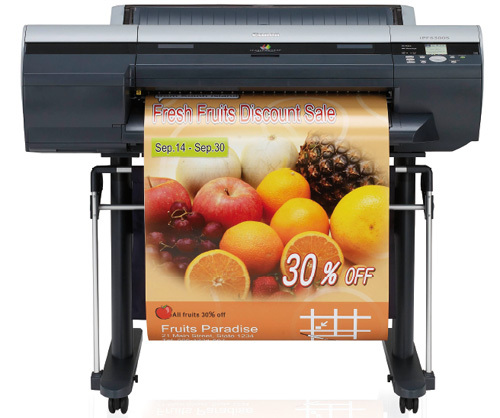 The LCD display allows easy access to different functions, and ink tank and paper roll loading is pretty simple. In addition to its basic features, the Canon ImagePROGRAF iPF6300S boasts add-ons like PosterArtist Lite and print plug-ins for Adobe Photoshop, MS Office, and Digital Professional. The Canon ImagePROGRAF iPF 6300S boasts high speed printing, producing quality A1 prints in just 2 minutes. The 160GB hard drive allows easy storage and access to print jobs right from the LCD panel. Print output resolution is an impressive 2,400 x 1,200, and the gigabit Ethernet compatibility allows fast data transfer, however data heavy the files are and how high the job volume is. In terms of economy, the Canon ImagePROGRAF iPF6300S reduces printing costs with its 'fast' mode, which increases the speed of production and 'economy' print mode, which helps reduce ink consumption. The printer comes integrated with accounting software, which helps track print costs and project returns easily. The price is quite steep but worth every penny for many Canon Image PROGRAF iPF6300S fans.